This is the official ACT Seniors Card website with information about obtaining a card, finding participating businesses, special offers and discounts, and information for businesses about how to participate. What is an ACT Seniors Card? The ACT Seniors Card is part of an Australia-wide initiative jointly supported by the ACT Government and Council on the Ageing (ACT). Each state and territory has a Seniors Card Scheme and some reciprocal arrangements are in place for using your card in other states and the Northern Territory. The scheme recognises the valuable contribution of older people in their local community. 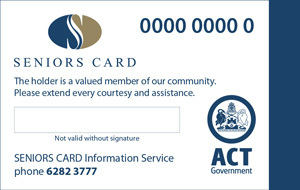 The ACT Seniors Card is issued free and provides access to savings on a range of goods and services provided by participating businesses. A combination of government and non-government businesses make up the 300 participating organisations that provide a number of benefits and discounts on a wide range of goods and services. Click here for the Discount Directory.